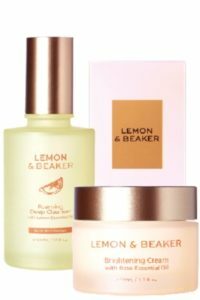 Inspired by the power of nature and the beauty of natural skin, Lemon & Beaker showcases natural ingredients to deliver visible results and rejuvenate skin. Created to cleanse, revitalise and protect skin from pollutants and stress, Lemon and Beaker formulations combine NZ lemon peel oil, rose essential oil and other gorgeous oils. This luxurious range includes the Lemon & Beaker Foaming Deep Cleanser, Hydrating Toner and Brightening Cream Vegan and cruelty-free, products are not tested on animals and come in eco-friendly glassware. The good news is we have all three Lemon & Beaker products (valued at more than RRP $115) up for grabs. To enter our latest competition, simply fill in the form below and ensure the Subscribe box is ticked to to receive our e-editions by email. One entry per person/email address; entries close on the last day of each month. Winner notified by phone or email. Previous articleHow can you not feel hope?